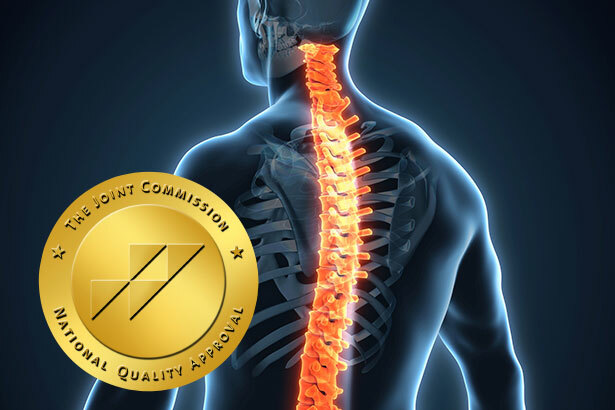 March 3, 2017 — After a rigorous on-site review, Englewood Hospital and Medical Center has earned The Joint Commission’s Gold Seal of Approval® for Spinal Fusion Certification for the third consecutive time since 2012. It is the only hospital in New Jersey to receive a Gold Seal for spinal fusion, a symbol of quality that reflects an organization’s commitment to providing safe and effective patient care. Englewood Hospital was also recertified with the Gold Seal of Approval® for Advanced Certification for Total Hip and Total Knee Replacement and with the Gold Seal of Approval® for Advanced Certification for Primary Stroke Centers. At Englewood Hospital and Medical Center, the spinal surgery team includes neurosurgeons and orthopedic surgeons, as well as anesthesiologists, pain management specialists, registered nurses, physician assistants and advanced practice nurses, rehabilitation specialists, and other professionals dedicated to restoring patients to a state of optimal health and well-being. In addition to being the only hospital in New Jersey to receive this Joint Commission certification in spinal fusion, Englewood Hospital and Medical Center is ranked No. 1 in the state and among the top 10 percent in the nation by CareChex/Quantros for both medical excellence and patient safety in spinal fusion, and has been a 5-Star Recipient for spinal fusion surgery for five years in a row by Healthgrades. The hospital underwent a review in September 2016 for all three programs in which Joint Commission experts evaluated compliance with national disease-specific care standards. Clinical practice guidelines and performance measures also were assessed.